In my Stash Delve: Knitting needle case post I mentioned that I really wanted to make a See Kate Sew Envelope Clutch… and you can hold me to my word. I kept coming across a purple off-cut (actually red and blue woven fibres) in my acquired stash. It has a strip of embroidery running parallel to the selvage so I began to wonder if I could orientate the clutch pattern in a way that would look deliberately funky and not haphazard. It turns out that I could do just that… back and front! 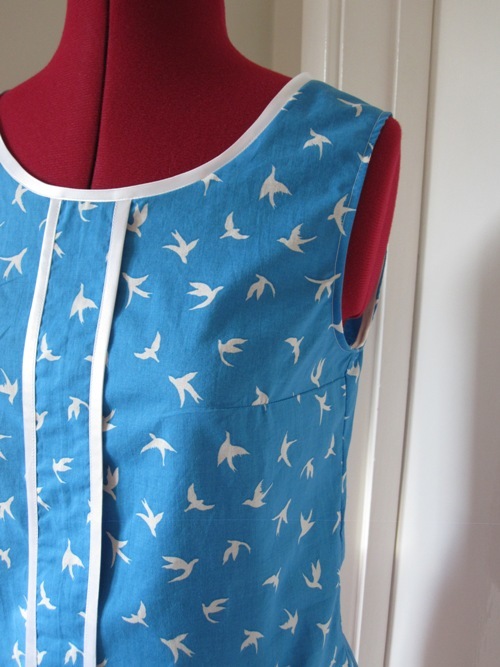 The pattern calls for fusible interfacing which stopped any bias cut wonk in its tracks. I used Velcro on the inside instead of a button (yes, I stash delved 3 inches of Velcro too!). This was my favourite stash delve so far and it is purely because of the way the pattern comes together like an envelope. It is genius without being impossible to follow… and it’s free (thank-you Kate!). As the tone of my knicker stash delve revealed, I was dissatisfied with the end product; two of the three elasticated openings were scruffy because I was practicing this technique. The elastic went into my swimsuit leg holes so easily it was almost a shame to fold over and top stitch! 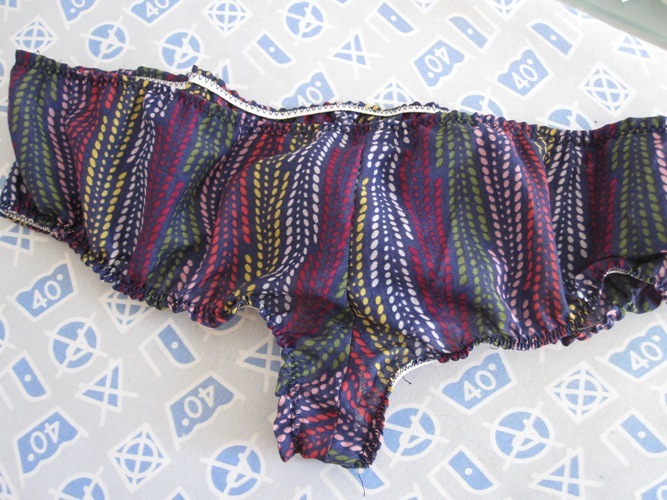 So it just felt right for me to revisit the Amerson Undies free pattern and knicker making. 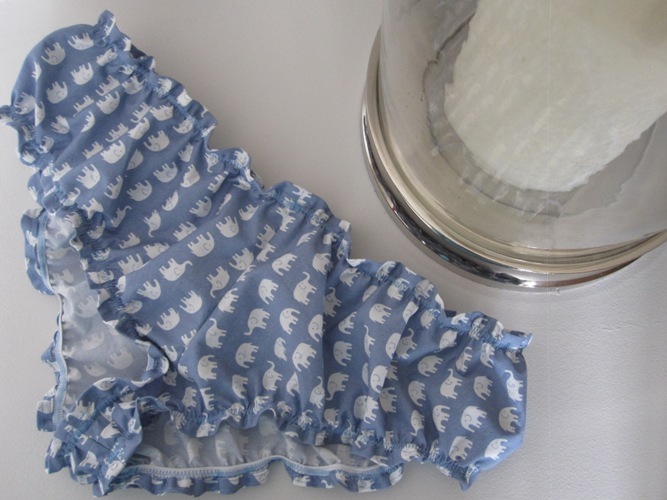 That and I couldn’t resist this light weight cotton that combined two of my favourite things – blue and elephants. The thing that finally helped me to understand the logistics of what my hands should be doing while zig zag stitching elastic was Briansew’s clip on YouTube. 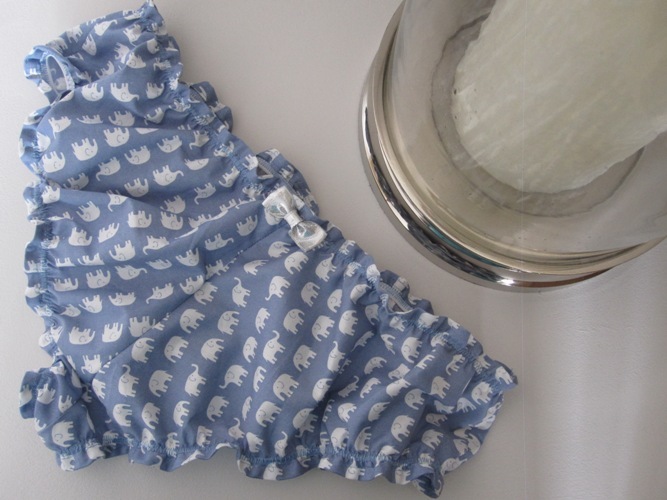 While I’d mastered elastic sewing, my pattern placement could have done with come closer attention – elephants marching in all directions but the way I intended! 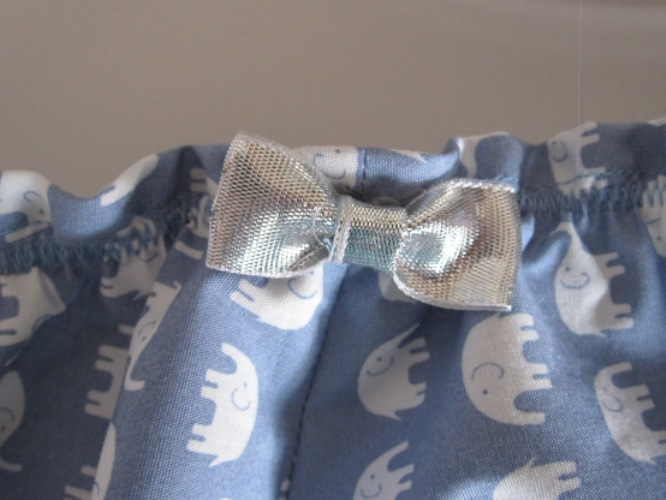 I hoped that a silver ribbon bow at the back would distract any attention from my poor pattern placement. No Tofinos here I’m afraid. I was riding on a beginner self-drafted pattern high from my maxi skirt so I launched into a slightly more challenging but still pretty basic self-drafting project – pyjama bottoms. 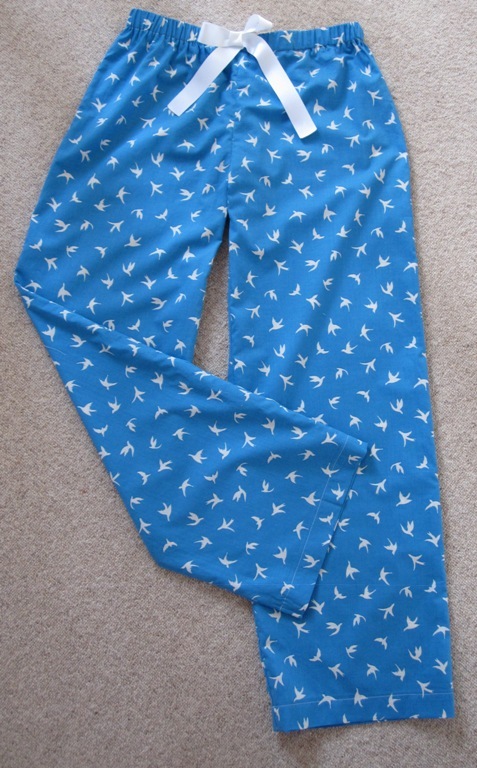 After scrutinising my favourite pyjama bottoms very closely, I realised that they fit so well because the back panels have more fabric than the front panels – space for my behind but no excess fabric at the tummy. 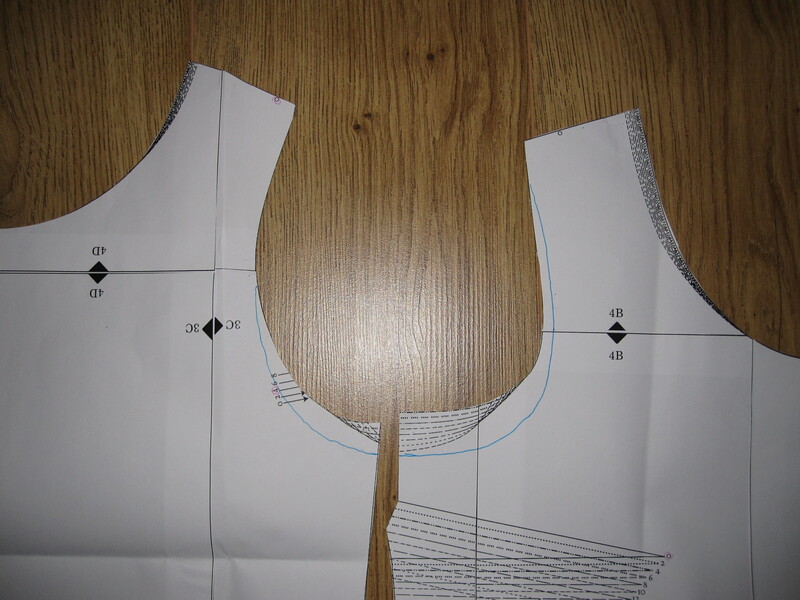 So I drafted two pattern pieces and got stuck into cutting out. 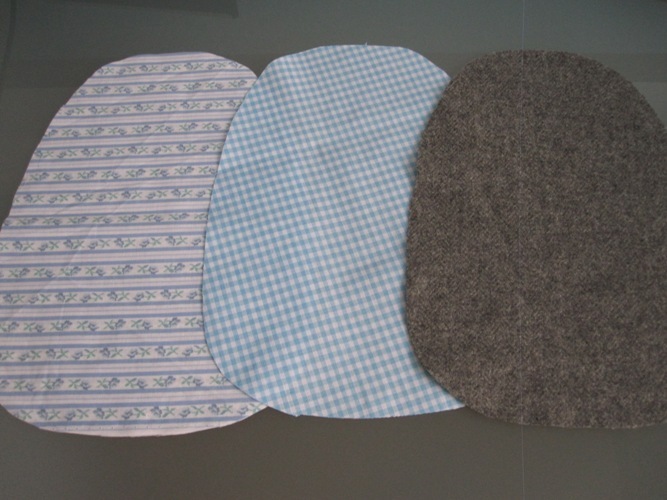 The fabric is a lovely soft cotton lawn – comfort is essential for a good nights sleep. The waist is elasticated but I couldn’t resist a fake waist tie with white Petersham ribbon. 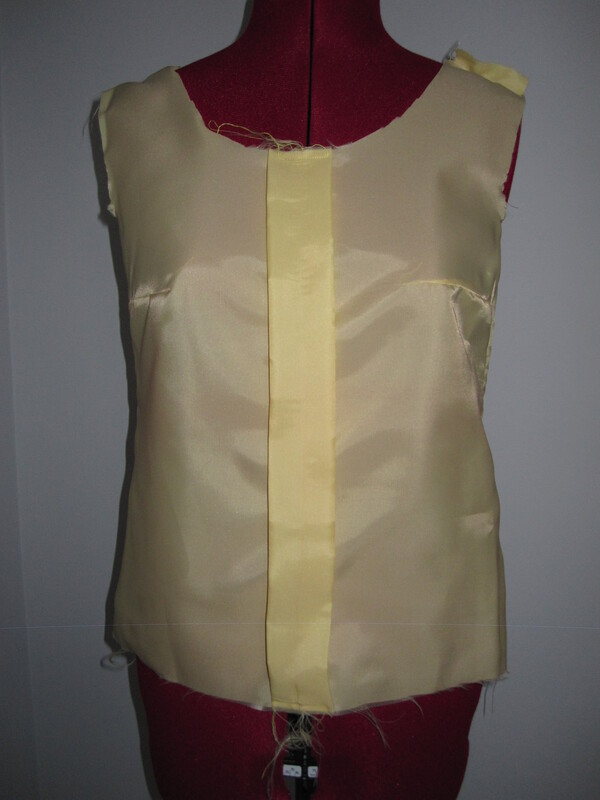 I made the top using the Colette Sorbetto pattern and attached satin bias binding down the front pleat. Both top and bottoms were made with French seams for last-ability and comfy sleeping. 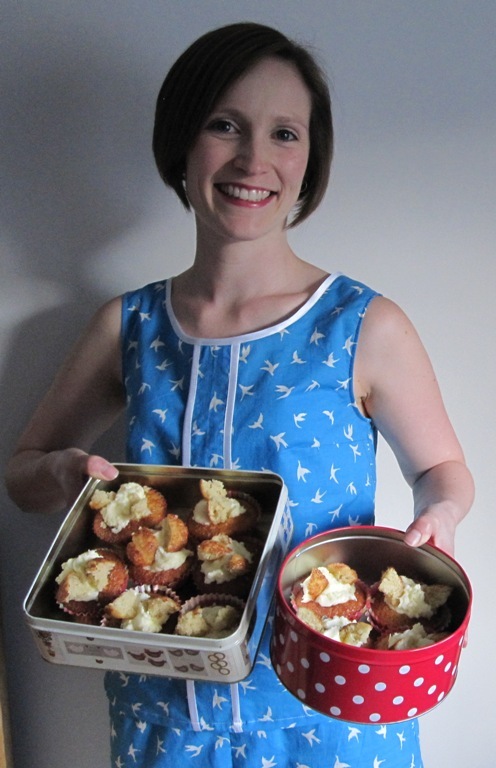 On with the party… I raised the matter of a midnight feast on Karen’s Pyjama Party primer post. It’d be rude not to bring something to the party so… who would like a fairy cake? 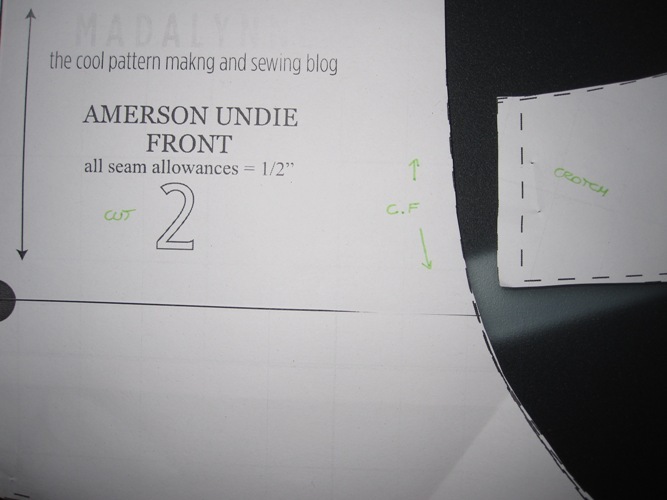 It took me at least ten minutes to work out which was the centre front seam of the free Amerson Undie pattern from Madalynne. Once I’d worked it out, I wrote it on the pattern pieces for future reference. The stash delved fabric is leftover silk-cotton blend from my Ditto Dotty Dress. Unfortunately there wasn’t enough fabric left to match the print at the seams. 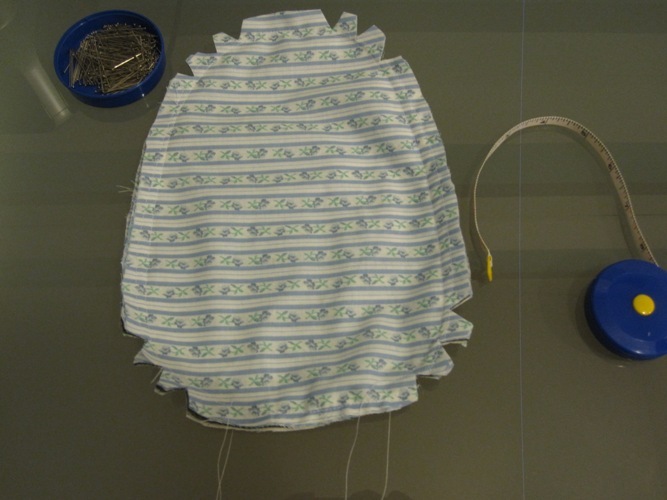 I found sewing the elastic with zigzag stitch a bit tricky – I felt like I was wrestling with my sewing machine. 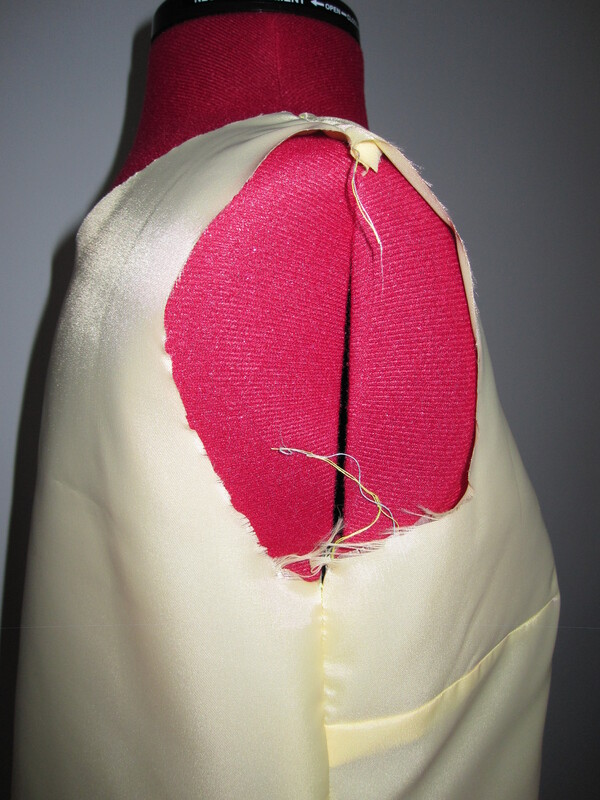 There is visible improvement between the waist and first leg hole. Then I found a few online videos clips which helped me to work out where my hands should be and I realised that my error was I was holding the fabric and elastic up in the air instead of stretching the elastic then anchoring this to the fabric by pressing into the extension table and following the speed of the feed dogs through. The second leg hole has even stitching all the way round! I needed to master this technique for the swimsuit I’m making for Swimalong 2013. On reflection, I won’t be putting the underwear shops out of business… but I might have a second go. With the case of the suspect fabric solved I stopped pretending to be a detective/crime writer and pretended to be a pet owner to purchase some sawdust. My local independent pet store was happy to oblige for £1.80 (enough to make 6 or 7 tailor’s hams!). I used the free pattern and tutorial available from Chance of Rain. The pattern and tutorial are really simple to follow. 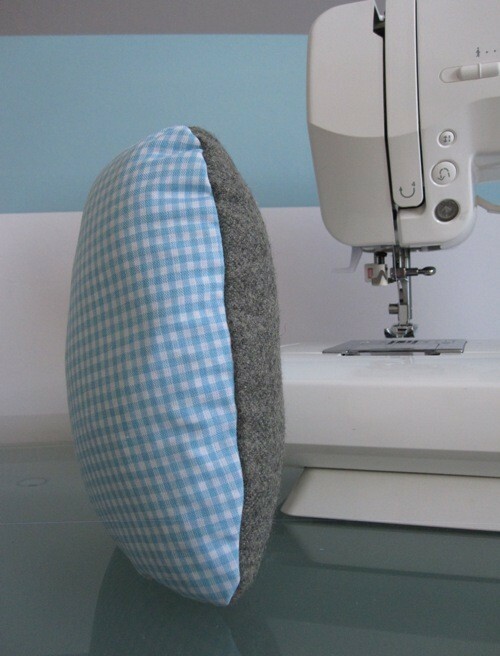 Requiring 3 oval pieces of cotton that become the inner and won’t be seen, 1 oval of cotton and 1 oval of wool both of which will be seen on the outside. The downloadable pattern also has bonus kidney and large tailor’s ham outlines. After basting the pieces together, the outer cotton and wool are placed right sides together, sewn around leaving a gap and curves clipped. After turning right sides out, the ham is ready to be filled with sawdust. This part was quite tricky and a little messy! I made sure to pack down as I went, pushing the sawdust into the seams and curves. Then I hand stitched the gap with strong thread. A quick vacuum (to get the sawdust bits off the outside) and it was ready for use. And… rather excitingly it matches ‘the office’ which my husband has renamed ‘the sewing room’. 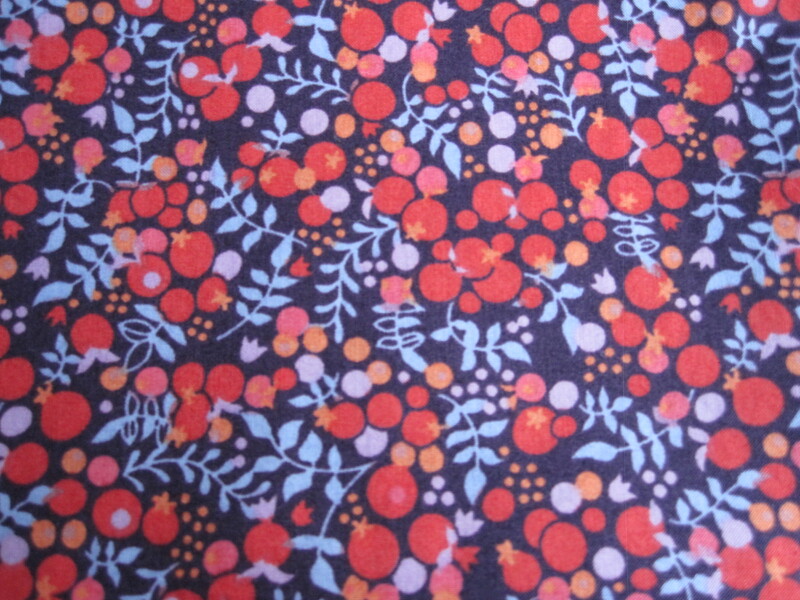 When I found this fabric amongst my acquired stash, I thought it might be a Liberty of London print. A quick search of the internet revealed that the print I recognised is called Wiltshire from the Liberty Art Fabrics Collection. I enjoyed reading about the history of Liberty fabrics and learnt that the berry and leaf print was first designed in 1933 and redesigned by Tana in 1968. 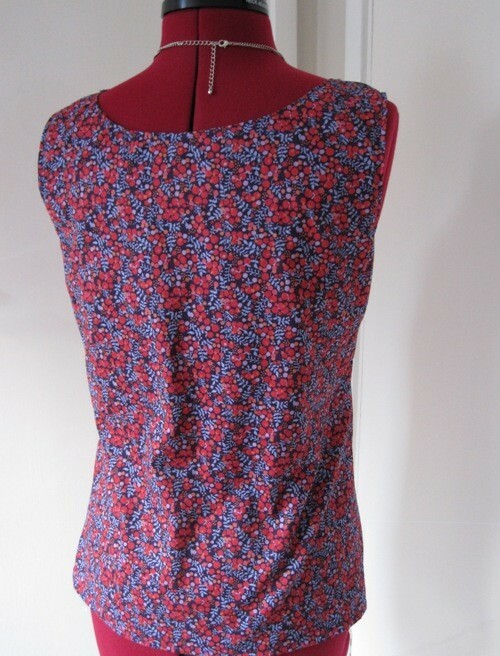 However, I can’t find this particular colourway anywhere (navy background, reddish-pink berries and blue-lilac leaves)… it’s somewhat of a mystery. I have two theories: rare or a copy. Regardless, I was excited to have it available for my use and thought it’d make a beautiful Sorbetto blouse, a free pattern available from the Coletterie. 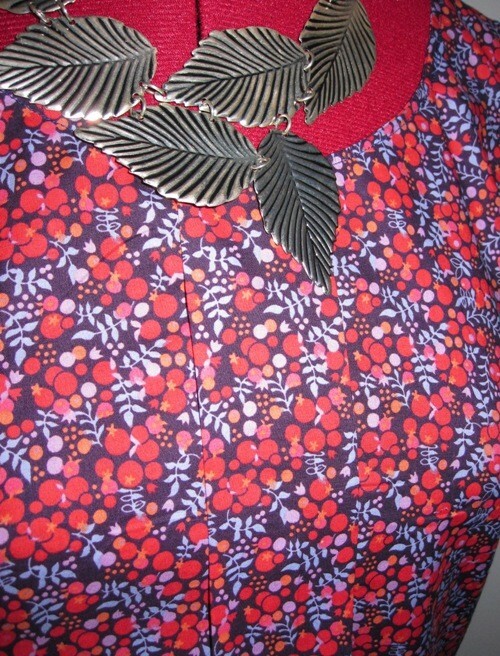 Using my amended pattern pieces, I carefully cut out the mysterious leaf and berries fabric. Following on with the lemon Sorbetto toile, I rehearsed bias binding attachment using the facing method described in a Coletterie Tutorial. 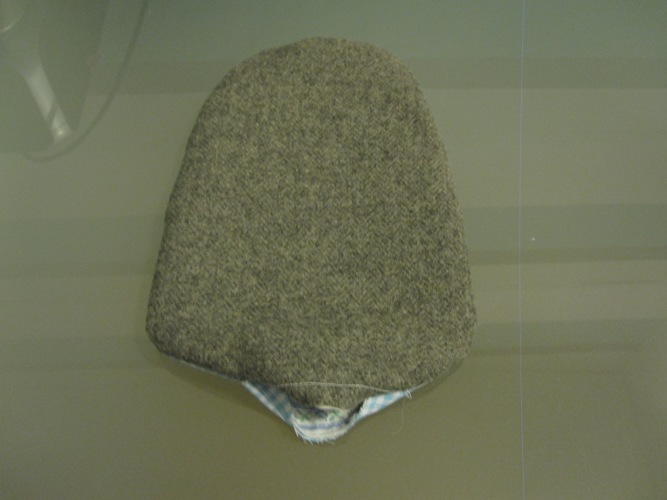 It worked a treat and my stitching came out really neatly (just seen in the below image). I’m really proud of the finished blouse. I took my time with cutting, sewing and pressing which paid off. As you can see, I’ve already started accessorising which means it’ll be quickly integrated into my wardrobe. The wonderful things about blogs are the sharing of ideas, links and makes. 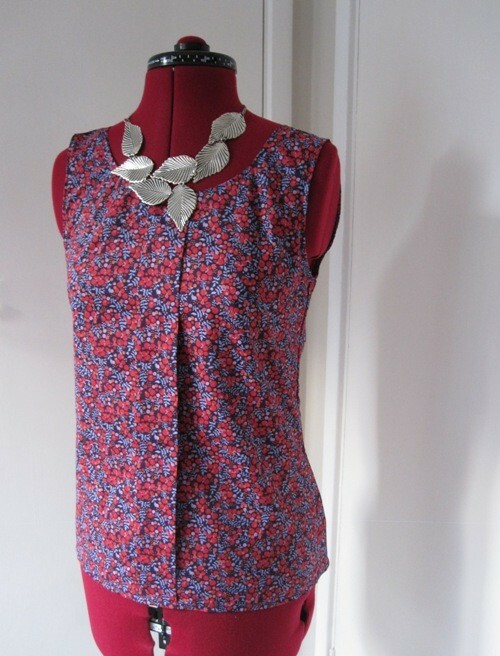 After much browsing, sewing bloggers had me convinced that the Colette Sorbetto is a simple beginner blouse pattern (appropriate for my skill level) that is quick to make, highly customisable and a veritable wardrobe staple. 1. Jenny of Bobbins and Whimsy‘s cheerfully bright version with the perfect colour of piping and binding. 2. Shona’s funky floral number blogged on Shona Stiches. 3. A crease-free personality version the fourth Sorbetto by Karen of Didyoumakethat? Unfortunately this lovely lemon lining fell into the ‘stained’ category of my acquired stash – I couldn’t get the pink staining out in the wash. Never mind, it was destined to be a Sorbetto toile. Spot the shoulder seam mistake? As many others have mentioned an extra 1-2 inches in length is needed – I added this before cutting. There were fewer mentions of tight armholes, until I searched for this problem specifically. To combat this I lined up New Look 6483 with the Sorbetto pattern pieces at the shoulders and traced the underarm line on both back and front pattern pieces. There was a fair amount to be cut away but the result is much better fit around the arms.